Lindy Barbour was born in Kirkwall then moved to Tayport in Fife. She read English at Oxford, and teaches Counselling and Psychotherapy at the University of Edinburgh. She has two children, and lives in rural Lanarkshire, near the Pentland Hills. had to wash using the kitchen sink. smelled as always of paraffin and bare boards. as white and round as the full moon. gaze at the roses through two layers of glass. with fish swimming in moonlight in a dark garden. Liz Berry was born in the Black Country. She received an Eric Gregory Award in 2009. Her pamphlet, The Patron Saint of Schoolgirls, was published by tall-lighthouse in 2010. She is a visiting writer at Kingston University and a 2011/12 Arvon/Jerwood Mentee. brought us up to the light. Antony Dunn has published three collections of poems, Pilots and Navigators (Oxford University Press, 1998), Flying Fish (Carcanet OxfordPoets, 2002) and Bugs (Carcanet OxfordPoets, 2009). He is working towards completion of a fourth. the needle through your skin and push it in. all undone in a too-bright cubicle. Gentlemen and Ladies, raise your glasses. becoming, nothing after nothing, air. Rosalind Hudis is an emerging poet from Ceredigion. She has always written, but decided to go full-time in 2009, beginning an MA in Creative Writing at Trinity St David’s. Since then, she has had poems published and won the Wilfred Owen Bursary. of her cot, that remind me of birch trees. itself properly inside its blue forest. the size of a large bee, into air. in the thicket of tubes. Helen Klein Ross, a former copywriter, has written hundreds of ads for household products. She lives in New York where she works on the Poetry Society of America’s campaign to restore Poetry in Motion to New York City’s subways. can be somewhat simplified by small rugs. but little damage is done by simple pastorals. S.J. Litherland, born and bred in Warwickshire, became an honorary Northerner after moving to Durham City in 1965. She has published six collections of poetry, of which the most recent is The Absolute Bonus of Rain (Flambard Press, 2010). came the replies of the tiny waves. It was terrible music to the demented. with pollen. The twelve hung in the sun. to turn our backs on all that merriment. Ian McEwan is a charity trustee, philosophy tutor and treasurer of Magma Poetry. Many magazines have published his poems and The Stammering Man was a winner in the Templar pamphlet competition 2010. Ian has four children and lives in Bedford. Jon Stone is the co-creator of small press Sidekick Books and arts journal Fuselit. His pamphlet, Scarecrows, was published by Happenstance in 2010 and a debut full collection, School of Forgery, is due from Salt imminently. Read more about The National Poetry Competition. Read more about The Poetry Society. This entry was posted in news, poetry and tagged 2011 National Poetry Competition Commended Poets, Antony Dunn In Vitro, Helen Klein Ross How to Furnish an American House, Ian McEwen Our Lady of the Pylons, Jon Stone Blue Poison Dart Frog, Lindy Barbour White Basin, Liz Berry Birmingham Roller, Poetry Society National Poetry Competition, Rosalind Hudis Photograph, SJ Litherland Springtime of the Nations on 29/03/2012 by peony moon. Allison McVety has become the 35th winner of the Poetry Society’s National Poetry Competition, with her multi-layered poem, ‘To the Lighthouse’. Read ‘To the Lighthouse’ on the Poetry Society’s website. Allison said she found winning the competition “unfeasible and thrilling”. She said, “In the context of the poem, winning the National is like being the most unlikely candidate for head girl and suddenly, in assembly, hearing your name called out”. The judges – Jackie Kay, John Glenday, and Colette Bryce – read 11,663 new poems from 4,498 poets to arrive at their decisions. All the entries were anonymous. Samantha Wynne-Rhydderch won second prize with her poem ‘Ponting’, inspired by the centenary of Captain Scott’s trip to the Antarctic, and third prize went to Zaffar Kunial for his poem ‘Hill Speak’, about his father’s native language. Allison McVety won the Poetry Business Book and Pamphlet competition 2006 with The Night Trotsky Came to Stay (Smith/Doorstop, 2007), and her second collection, Miming Happiness, followed in 2010. For many years an engineer, technical trainer and ITIL service manager at Microsoft, Allison left to manage a digital forensics company. She now works part-time for Smith/Doorstop and is writing her third collection. Peony Moon was lucky to have a brief chat with Allison. Congratulations! What’s the best thing so far about winning the National? For most of us, winning the National is one of those career milestones that is both wished for and unachievable in equal measure. So the realisation that my poem had indeed won and would appear on the Poetry Society website, in Poetry Review and The Guardian was a perfect joy! For ‘To the Lighthouse’ to have been under the eyes of a panel of judges whose own work I’ve read and admired and for it to be liked enough is like a dream. And, since I’ve had to keep the secret for a number of weeks, it’s been great to have the lovely team at The Poetry Society there to pinch me! Back in the day, would that girl in the examination hall have been very surprised to hear that she would grow up into a poet? Difficult question. Although I was writing poems at seventeen and would’ve liked a career in writing, my parents were keen on academic success. They saw a degree and a secure career as the only way for me to have a life that was markedly different from theirs. But don’t write this off as a sob story because they really did give me the wherewithal to have my cake and eat it! As the winning poem is about an exam – what have you learned from writing poetry? I’ve learned to look and see, listen and hear, much more acutely than I ever did. I know that may sound glib, a little obvious even, but if, as Andrew Motion says, a poem is one idea leaning against the next, then writers have to be receptive to the extraordinary that is everywhere in the ordinariness of their own lives – the good and the bad. After all, how else can we ‘Write it’? And if I could tell my seventeen year old self anything, it would be that all the mistakes, all the things that seem end-of-the world huge at the time, are just the drafts that make life better. But then, would my seventeen year old self have listened to my advice? Probably not. Samantha Wynne-Rhydderch‘s two collections are Rockclimbing in Silk (Seren, 2001) and Not in These Shoes (Picador, 2008), which was shortlisted for Wales book of the Year 2009. Her third collection, Banjo, celebrates the centenary of Captain Scott’s trip to the Anarctic, and will be published by Picador in June 2012.
of frost the film’s ribbon will split. round a ski stick to get the direction right. data; how composed we were, how cold. Zaffar Kunial has been writing poetry for years, and studied in London with Michael Donaghy. He is part of a writing group in Leeds that includes both the poet Ian Duhig and last year’s National Poetry Competition winner, Paul Adrian. He writes greeting cards, and wrote a rhyming children’s book for M&S. ‘Hill Speak’ is the first poem he has submitted anywhere for publication. There is no dictionary for my father’s language. His dialect, for a start, is difficult to name. Even this taxi driver, who talks it, lacks the knowledge. too earthy and scriptless to find a home in books. This mountain speech is a low language. Ours. “No good. You should learn speak Urdu.” I’m getting the runaround. Landa, in the reign of the Buddhists. … So was Dad’s speech some kind of Dogri? Is it Kashmiri? Mirpuri? The differences are lost on me. never mind stumbling towards some higher plane. Jackie Kay MBE was born in 1961 in Edinburgh to a Scottish mother and a Nigerian father, and raised by adoptive parents. Her first poetry collection, The Adoption Papers, won the Scottish Arts Council Book Award and a Saltire Society Scottish First Book of the Year Award. She has written numerous collections of poetry as well as fiction, drama and memoir, and appears regularly on the radio. Maw Broon Monologues (2009) was shortlisted for the Ted Hughes Award for New Work in Poetry, and Red Dust Road (2010), a memoir about meeting her Nigerian birth father, was shortlisted for the 2011 PEN/Ackerley Prize. She was awarded an MBE in 2006. John Glenday‘s poetry collections are The Apple Ghost (1989) and Undark (1995), both published by Peterloo Poets, and Grain (2010), published by Picador. He was awarded a Scottish Arts Council Book Prize for The Apple Ghost, and Undark and Grain both received Poetry Book Society Recommendations. In 2010 he was shortlisted for the Ted Hughes Prize for Excellence in New Poetry, and for the Griffin Poetry Prize 2010 for Grain. He lives in Drumnadrochit, and works for NHS Highland as an addictions counsellor. Colette Bryce A previous winner of the National Poetry Competition (2003), Colette Bryce has been North East Literary Fellow at the universities of Newcastle and Durham, and is currently poetry editor at Poetry London magazine. Her three collections, all published by Picador, are The Heel of Bernadette (2000), The Full Indian Rope Trick (2004), and Self-Portrait in the Dark (2008), which was short-listed for the Irish Times Poetry Now Award. Her pamphlet, The Observations of Aleksandr Svetlov, was published by Donut Press in 2007. She received the Cholmondeley Award in 2010. This entry was posted in news, poetry and tagged 2011 National Poetry Competition, 2011 National Poetry Competition winners, Allison McVety 2011 National Poetry Competition winner, Allison McVety To the Lighthouse, Poetry Society's 2011 National Poetry Competition winners, Samantha Wynne-Rhydderch Ponting, Zaffar Kunial Hill Speak on 28/03/2012 by peony moon. “Cape Town and London, November 23, 2011 — South African PEN and PEN International today expressed alarm over the passage of the Protection of Information Bill by the National Assembly, saying that the bill, if enacted into law, represents ‘a retreat towards the secrecy that characterised South Africa before its democratic transition’. The Protection of Information Bill, popularly called the Secrecy Bill, would eliminate whistleblower protections, force journalists to reveal their sources, and criminalise the withholding of classifed information. The bill does not allow for a “public interest defence”, meaning that journalists would not be protected for leaking information even when exposing government corruption or misconduct. Sentences may be as high as 25 years. The bill was introduced in 2008 and has met with strong civil society and media opposition. Pressure from Sanef (SA National Editors’ Forum), PMSA (Print Media South Africa), lawyers, other civil society organisations and the Right2Know campaign – a broad coalition of organisations – forced the ruling African National Congress (ANC) to withdraw earlier text and narrow the scope of “organs of state” that could classify information. However, the most restrictive provisions remain in place. Last week, the ANC leaked that it would reintroduce the bill in parliament, despite assurances that the party would seek civil society input. The bill was quickly debated and passed by a significant margin. It now has to pass through the National Council of Provinces, among other procedures, and to be signed into law by President Zuma. Visit South African PEN’s website. This entry was posted in news and tagged freedom of expression, freedom of the press, Laura McVeigh, Margie Orford, PEN International, Protection of Information Bill, public interest defence, Right2Know, Secrecy Bill, South African PEN on 24/11/2011 by peony moon. Kona Macphee was born in London in 1969 but grew up in Australia, where she experimented with a range of occupations including composer, violinist, waitress and motorcycle mechanic. Eventually she took up robotics and computer science, which brought her to Cambridge as a graduate student in 1995. She now lives in Perthshire, where she works as a freelance writer and tutor, and moonlights as the co-director of a software and consultancy company. Kona received an Eric Gregory Award in 1998. Her first collection, Tails, was published by Bloodaxe Books in 2004, and her second collection, Perfect Blue, was published by Bloodaxe Books in 2010. In Perfect Blue, Kona Macphee applies her versatile and polished technique to a characteristic diversity of themes – from the natural world to war and politics, from memories of childhood to bittersweet snapshots of everyday life, from wry asides to fantastical flights of narrative fantasy. Her eclecticism is never more apparent than in the ‘Book of Diseases’ sequence, which launches from its simple premise into a delirious medley of forms and subjects. The meticulously crafted lyrical poems of Perfect Blue reflect the growing power of a distinctively original, musical and compassionate voice that laments the transience and fragility of life while celebrating the joy of truly living it. the buzz of resurrection borne on spring. that smoking moment held: a Pietà. These conflicts always stem from faith or race. the farmers, with their yearly crop to lose. this morning, near the long employment queues. The children here have vanished without trace. for victims trickling back in ones and twos. the painful memories. More in tomorrow’s news. This poem was first published in Magma, Issue 43, 2009.
we can’t not watch his colours in the sunlight. that sling his slow kin cockeyed in the gutter? falls just a lumen dimmer with his passing. itself in some pert metaphor. Take a deep breath. Now be here. Be. Order Perfect Blue here or here. Visit Kona’s blog, that elusive clarity. This entry was posted in books, news, poetry and tagged Kona Macphee Geoffrey Faber Memorial Prize, Kona Macphee Marchmont Road, Kona Macphee Newsbites, Kona Macphee Perfect Blue, Kona Macphee Pheasant and astronomers, Kona Macphee poems, Kona Macphee poet, Kona Macphee The invention of the electric chair on 24/06/2011 by peony moon. Next Sunday I’ll be flying to Cape Town, the Mother City, the Tavern of the Seas. I’m looking forward to catching up with old friends, meeting new poetry friends, reading at Off the Wall in Observatory on Monday, 27 June, and launching The Suitable Girl (co-published by Pindrop Press and Modjaji Books) at The Book Lounge on Tuesday, 28 June. If you’re in the area I’d love to see you on Monday or Tuesday evening – or both! Hosted by Karin Schimke and Huge Hodge, Off the Wall is a well established weekly event held at A Touch of Madness (love the name! ), a Victorian Quaffery, ‘in the heart of bohemian Observatory’. After the reading there will an open mike session so come along and share your work. I’m thrilled that Helen Moffett will be introducing me at the launch and can’t wait to see Colleen Higgs again. Colleen is the inspiration behind Modjaji Books and the last time we saw each other was at the Cape Town Book Fair in 2006. It’s been far too long. There’ll be wine sponsored by Leopard’s Leap, soul food and books – lots and lots of books. This entry was posted in books, news, poetry, poetry launches and tagged Cape Town bookshops, Cape Town poetry, Cape Town poetry launches, Colleen Higgs publisher, Helen Moffett poet, Hugh Hodge poet, Karin Schimke poet, Leopard's Leap Wines, Mervyn Sloman, Michelle McGrane poet, Michelle McGrane The Suitable Girl, Modjaji Books, Off the Wall Poetry, Off the Wall readings, The Book Lounge Cape Town on 18/06/2011 by peony moon. Independent publisher Modjaji Books will be bringing out a South African edition of The Suitable Girl in April. You can see from the photograph that she’s made her way to Atlanta in the United States. Thank you, Christine Swint. If you’re interested, The Suitable Girl can be ordered via Paypal from the Pindrop Press website (see details at the bottom of my author page). Recent and soon to be released books can also be bought as part of this offer. Email Colleen Higgs at cdhiggs@gmail.com if you want to take up this offer. This entry was posted in books, news, poetry and tagged Alleyn Diesel, Christine Swint, Colleen Higgs Lava Lamp Poems, Dawn Garisch Difficult Gifts, Hands-On Books, Julie Buffaloe-Yoder, Modjaji Books, Pindrop Press, Reclaiming the L-Word, Robin Winkel-Mellish Leading the Lioness, Sarah Frost Conduit, The Suitable Girl, Wame Molefhe Go Tell the Sun on 27/02/2011 by peony moon. I Am Somebody! is a youth organisation that uses storytelling to bring together 18 to 21 year olds from all races, cultures and classes in Cape Town. Using life and archetypal storytelling, the organisers run a two-year mentorship programme with young people to develop their self-awareness, get them to connect across the invisible barriers of race, culture and class to understand one another and build relationships based on compassion and trust. They help young people develop their innate gifts and then use these to address needs and issues in their own communities. The mentees will research issues in their own communities and identify one area they would like to tackle. The group will then bring their individual research together and using the skills, knowledge and resources of all the communities represented, they will develop creative solutions to their problems. The organisation’s aim is to use the talents of all communities to start developing solutions to Cape Town’s problems from the ground up. Visit Warren T Te Brugge’s blog to read a short article and watch a video clip. RSVP to Toni Stuart on 071 5733 597 or tonistuart@gmail.com by Wednesday, 21 July 2010. 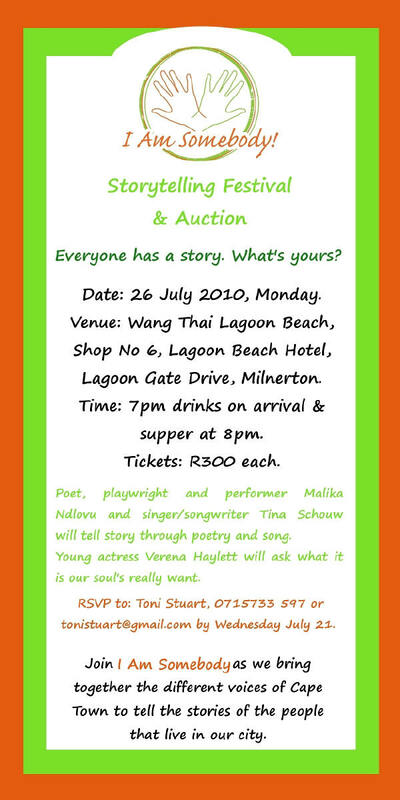 This entry was posted in news and tagged Cape Town mentorship programmes, Cape Town youth organisations, Malika Ndlovu, the voices of Cape Town, Tina Schouw, Toni Stuart, Verena Haylett on 15/07/2010 by peony moon. “Many have songs but are silenced before they can sing. Many of the voices lost to HIV/AIDS will never be heard. The talent lost cannot be calculated. Many of those who are lost never ‘hit the Big Time’. The language of their hearts never reached their lips. I don’t know how many or who they were. Mzwandile Matiwane was one and I knew him briefly. He wrote poetry while in St. Albans jail where he spent about 14 years. He told me that poetry saved his life there. In 2006 he sometimes appeared at ‘Off-The-Wall’ poetry evenings in Observatory, where he masqueraded as ‘the Hobo Poet’. In the harsh Cape winter of that year he lived under cardboard beneath a bridge near Cape Town Castle. On one of my trips to drop him off at his ‘home’ he asked me to take care of some of his handwritten pages of poetry. The first page opened with a quote by Friedrich Nietzsche: ‘One always hears in the writings of a hermit something of the echo of the desert, something of the whisper and the shy vigilance of solitude’. His health deteriorated and in 2008 he moved back to his mother’s home in Port Elizabeth. He passed away shortly thereafter. In a phone call to him a few days before he died, he said: “It feels as if I am walking against the wind”. Lost Voices is an attempt, not only to honour Mzwandile’s tragic life, but also the many unknown voices that we have lost to HIV/AIDS. I have been joined in this project by the remarkable playwright and performer, Monty Jola. Monty was Mzwandile’s friend and mentor. His acclaimed play, A New Struggle, will form the centrepiece of our short evening of poetry, music, dance and performance. Our collaboration became possible when we teamed up with Dr. Ashraf Mohammed and the Peer Group Educators of the HIV/AIDS Unit of Cape Peninsula University of Technology. Proceeds from the evening will go to Mzwandile’s mother and to Monty Jola’s Township Theatre Performance Group. We look forward to a memorable evening. 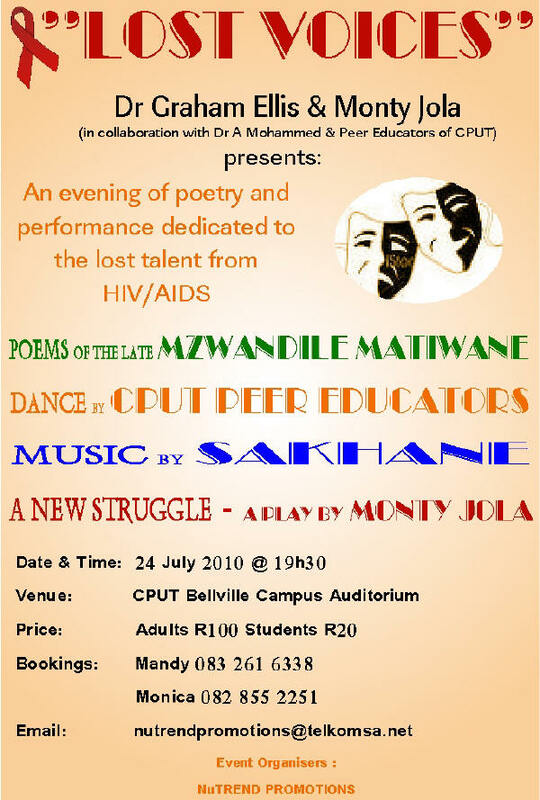 This entry was posted in art, news, poetry and tagged an evening of poetry and performance, CPUT Peer Educators, Dr. Ashraf Mohammed, Dr. Graham Ellis, HIV/AIDS, Monty Jola, Monty Jola's A New Struggle, Mzwandile Matiwane poet, Port Elizabeth poets, Sakhane, South African poetry, South African poets on 14/07/2010 by peony moon.